 With anagram games, kids rearrange letters of words to produce new words.  Kids enrich their vocabulary.  Listed as a best seller by toy shops. Anagrams are word games which consist in rearranging the letters of words or sentences in order to produce different words or sentences. For example, the word «satin» can be rearranged into «stain» or «seminar» can be transformed into «marines». They are a great way for kids to enrich their vocabulary and they can also be lots of family fun! Younger as well as older children can play these games. Younger children can learn their alphabet and how to spell. Older school age children enrich their vocabulary and keep their brains active. There are many anagram games that you can find. You can find books and anagram dictionaries. Newspapers also often contain anagram games. There are also websites and computer programs which are based on creating anagrams. Scrabble also has a version called Clabbers (which is an anagram of Scrabble) which consists in forming anagrams on the board. There is also the Boggle Word Game in which players must form words using a grid of 16 random letters. Bananagrams is like a combination of Boggle and Scrabble. That’s why it is a lot of fun. It has been listed as a best seller by toy shops and it is definitely a must have at home. Bananagram won many awards including the Top Toy of the Year award by Creative Child Magazine. In Bananagrams, players have to place lettered tiles from a pool (of 144 lettered tiles) into a crossword-style word arrangements and faster than other players. Bananagrams can be played by one to eight players. The same number of tiles is drawn by each player. The goal is to be the first to complete a word grid after the pool of tiles has been used up. If a player calls «Split», players have to turn over their tiles and show their letters ot all the other players. Then each player has to arrange the letters in order to form words which have to be connected like in a crosswords in an intersecting manner. When a player has used up all his tiles, he calls out «Peel» and each player must draw from the pool which contains the remaining tiles. If a player doesn’t want to use his tiles at any time in the game, he shouts «Dump» and exchanges any of his letter tiles for other letter tiles. The first player to have all of their tiles into a word grid shouts «Bananas». 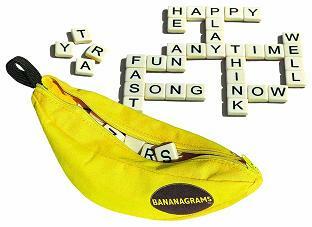 Bananagrams comes in a banana-shaped package. It is similar to the Scrabble variant called Take Two. Banagrams is also a great travel game that can be played anywhere in a few minutes! We also recommend www.word-grabber.com. It provides an anagram solver which can be a very useful tool in order to solve anagrams.